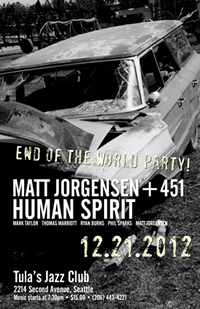 We all know that this Friday, December 21, 2012 (the last day on the Mayan Calendar), is sure to be the last day on Earth for all mankind … so what better way to end all existence than to join drummer Matt Jorgensen at Tula’s Jazz Club for a stellar night of music. Jorgensen will be joined by longtime bandmates Mark Taylor (saxophone), Thomas Marriott (trumpet), Ryan Burns (piano) and Phil Sparks (bass). The night will consist of music from the catalog of both groups Jorgensen is best known for. Matt Jorgensen +451 last performed in 2009. Their five albums on Origin Records, and their live shows throughout the 2000s established them as one of the premier groups in the Northwest. In 2003 they won the Earshot Golden Ear Award for Northwest Jazz Group of the Year. Human Spirit, co-led with Mark Taylor and Thomas Marriott, have spent the last year touring in support of their new recording, Dialogue: Live at the Earshot Jazz Festival, including performances in Vancouver, Portland, Chicago, Philadelphia and New York City. Reservations are recommended for what will be the last night on earth!